This article is about the Latin initialism. For other uses, see SPQR (disambiguation). SPQR (Latin: Senātus Populusque Rōmānus, "The Roman Senate and People", or more freely as "The Senate and People of Rome"; Classical Latin: [sɛˈnaː.tʊs pɔpʊˈlʊs.kᶣɛ roːˈmaː.nʊs]) refers to the government of the ancient Roman Republic. It appears on Roman currency, at the end of documents made public by inscription in stone or metal, and in dedications of monuments and public works. The phrase commonly appears in the Roman political, legal, and historical literature, such as the speeches of Cicero and Ab Urbe Condita Libri ("Books from the Founding of the City") of Livy. SPQR: Senātus Populusque Rōmānus. In Latin, Senātus is a nominative singular noun meaning "Senate". 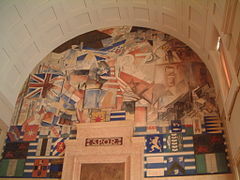 Populusque is compounded from the nominative noun Populus, "the People", and -que, an enclitic particle meaning "and" which connects the two nominative nouns. The last word, Rōmānus ("Roman") is an adjective modifying the whole of Senātus Populusque: the "Roman Senate and People", taken as a whole. Thus, the phrase is translated literally as "The Roman Senate and People", or more freely as "The Senate and People of Rome". The title's date of establishment is unknown, but it first appears in inscriptions of the Late Republic, from c. 80 BC onwards. Previously, the official name of the Roman state, as evidenced on coins, was simply ROMA. The abbreviation last appears on coins of Constantine the Great (ruled 312–337 AD), the first Roman emperor to support Christianity. The two legal entities mentioned, Senātus and the Populus Rōmānus, are sovereign when combined. However, where populus is sovereign alone, Senātus is not. Under the Roman Kingdom, neither entity was sovereign. The phrase, therefore, can be dated to no earlier than the foundation of the Republic. This signature continued in use under the Roman Empire. The emperors were considered the de jure representatives of the people even though the senātūs consulta, or decrees of the Senate, were made at the de facto pleasure of the emperor. Populus Rōmānus in Roman literature is a phrase meaning the government of the People. When the Romans named governments of other countries, they used populus in the singular or plural, such as populī Prīscōrum Latīnōrum, "the governments of the Old Latins". Rōmānus is the established adjective used to distinguish the Romans, as in cīvis Rōmānus, "Roman citizen". The Roman people appear very often in law and history in such phrases as dignitās, maiestās, auctoritās, lībertās populī Rōmānī, the "dignity, majesty, authority, freedom of the Roman people". They were a populus līber, "a free people". There was an exercitus, imperium, iudicia, honorēs, consulēs, voluntās of this same populus: "the army, rule, judgments, offices, consuls and will of the Roman people". They appear in early Latin as Popolus and Poplus, so the habit of thinking of themselves as free and sovereign was quite ingrained. The Romans believed that all authority came from the people. It could be said that similar language seen in more modern political and social revolutions directly comes from this usage. People in this sense meant the whole government. The latter, however, was essentially divided into the aristocratic Senate, whose will was executed by the consuls and praetors, and the comitia centuriāta, "committee of the centuries", whose will came to be safeguarded by the Tribunes. One of the ways the emperor Commodus (180–192) paid for his donatives and mass entertainments was to tax the senatorial order, and on many inscriptions, the traditional order is provocatively reversed (Populus Senatusque...). Beginning in 1184, the Commune of Rome struck coins in the name of the SENATVS P Q R. From 1414 until 1517, the Roman Senate struck coins with a shield inscribed SPQR. During the regime of Benito Mussolini, SPQR was emblazoned on a number of public buildings and manhole covers in an attempt to promote his dictatorship as a "New Roman Empire". 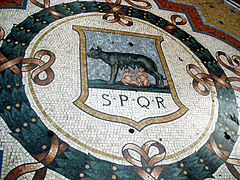 Even in contemporary usage, SPQR is still used as the municipal symbol of the city of Rome. 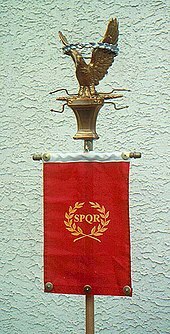 A modern recreation of a Roman standard. Alkmaar, Netherlands, SPQA on the facade of the Waag building, now cheese museum. Franeker, Netherlands, SPQF, At the a gate on the Westerbolwerk and Academiestraat 16. Freising, Germany, SPQF, above the door of the town hall. Ghent, Belgium, SPQG on the Opera, Theater and some other major buildings. In 1583, during the Dutch Revolt, Ghent struck coins with a shield inscribed SPQG. Haarlem, the Netherlands, SPQH on the face of the town hall at the "Grote Markt"
Milan, Italy, The Holy Roman Emperor Charles V struck coins at Milan with the inscription S P Q MEDIOL OPTIMO PRINCIPI. Naples, Italy, Coins struck during Masaniello’s 1647 revolt showed a shield inscribed SPQN. Oudenburg, Belgium, SPQO (Senatus Populusque Odenburgensis) on its water pump next to the market square. Valencia, Spain, SPQV in several places and buildings, including the Silk Exchange and the University of Valencia Historic Building. Some members of white supremacist groups have been using the acronym SPQR on flags, on their person (such as tattoos) and other forms of identification. The movement's enthusiasm for other symbols of republican Rome, such as the axe and bundled rods known as fasces, is documented, as well as their interest in some aspects of republican and imperial Rome. That use was discussed on Stormfront's bulletin boards and was noticed at white supremacist demonstrations. White supremacists tend to associate "SPQR" with the militaristic ethos of the Roman legions. There is in fact no evidence that the initialism appeared regularly on Roman military insignia and equipment, but it was heavily used by Mussolini's fascist regime. 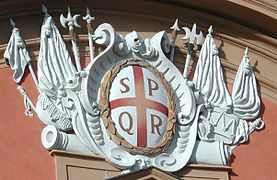 In the early twentieth century, the letters "SPQR" could sometimes be seen displayed on London market traders' stalls, meaning "Small Profits, Quick Returns". MPQN, standing for Metallica Populusque Nimus, appears on the cover of the Metallica live DVD Français Pour une Nuit, which was recorded in the Arena of Nîmes, a remodelled Roman amphiteatre. The Italians have long used a different and humorous expansion of this acronym, "Sono Pazzi Questi Romani" (literally: "They're crazy, these Romans"). In the Asterix and Obelix comics, Obelix often uses the French translation of this phrase, "Ils sont fous ces Romains", and in the Italian editions, the original phrase is used. In the cover of the Spanish Mort & Phil comic album La historia del dinero, Mort is carried on a litter as a Roman emperor, while his partner Phil holds a Roman standard topped by an umbrella with the tituli SPOR and SI LLUEVE (a pun, since Es por si llueve means "Just in case it rains" in Spanish). S.P.Q.R. Records was an American popular music record label, a subsidiary of Legrand Records, which flourished in the 1960s and included Gary U.S. Bonds among its artists. The label was founded by Frank Guida, who is believed to have adopted the name in allusion to his Italian origins. The football team A.S. Roma wore special edition shirts with SPQR on the chest for their match against city rivals S.S. Lazio on 29 April 2017. S.P.Q.R. is the fourth song on the critically acclaimed experimental rock album Deceit by This Heat. 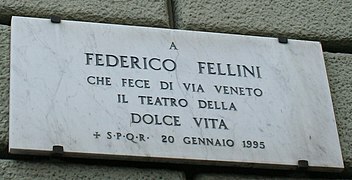 The song talks about atomic destruction and human morals using symbols of Rome. ^ a b "SPQR - Ancient Rome for Kids". rome.mrdonn.org. Retrieved 21 February 2018. ^ Heraldic symbols of Amsterdam, Livius.org, 2 December 2006. ^ "Flickr.com". Flickr.com. 5 January 2007. Retrieved 17 February 2014. ^ "brunnenfuehrer.ch". 1 January 2003. Retrieved 30 October 2015. ^ a b c d "Rome - Historical Flags (Italy)", CRWflags.com, 14 November 2003. ^ "Unesco.org" (PDF). Retrieved 17 February 2014. ^ "NGW.nl". NGW.nl. Retrieved 17 February 2014. ^ "Eupedia.com". Eupedia.com. Archived from the original on 17 April 2010. Retrieved 17 February 2014. ^ Coinage of the European Continent, W. Carew Hazlitt, page 216. ^ St George's HallBy Paul Coslett. "BBC.co.uk". BBC.co.uk. Retrieved 17 February 2014. ^ "Flickr.com". Flickr.com. 1 March 2007. Retrieved 17 February 2014. ^ The Coinage of Milan, W.. J. Potter, page 19 coin 4. ^ a b "Flickr.com". Flickr.com. 5 December 2007. Retrieved 17 February 2014. ^ "Flickr.com". Flickr.com. 17 June 2008. Retrieved 17 February 2014. ^ O. A. W. Dilke and Margaret S. Dilke (October 1961). "Terracina and the Pomptine Marshes". Greece & Rome. Cambridge University Press. II:8 (2): 172–178. ISSN 0017-3835. OCLC 51206579. ^ "Tibursuperbum.it". Tibursuperbum.it. Retrieved 17 February 2014. ^ "Biblioteca Virtual Miguel de Cervantes". Cervantesvirtual.com. Retrieved 17 February 2014. ^ Bond, Sarah E. (30 August 2018). "The misuse of an ancient Roman acronym by white nationalist groups". Hyperallergic. Retrieved 16 April 2019. ^ a b Angell, Ben; et al. (27 July 2018). "Scholars Respond to SPQR and White Nationalism". Pharos. Retrieved 16 April 2019. ^ a b Angell, Ben; et al. (15 June 2018). "SPQR and White Nationalism". Pharos. Retrieved 16 April 2019. ^ "Flags and Other Symbols Used By Far-Right Groups in Charlottesville". Southern Poverty Law Center. 12 August 2017. Retrieved 16 April 2019. ^ Angell, Ben; et al. (11 December 2017). ""American Fascist Manifesto" begins with the Roman Republic". Pharos. Retrieved 16 April 2019. ^ Fowler, H. W.; Fowler, F. G.; Crystal, David (2011) . The Concise Oxford Dictionary: The Classic First Edition. Oxford: Oxford University Press. p. 748. ISBN 978-0-19-969612-3. ^ See, e.g. von Hefner, Otto Titan (1861). Handbuch der theoretischen und praktischen Heraldik. Munich. p. 106. ^ La historia del dinero, 1980, Editorial Bruguera/Bankunión. ^ "Biography – S.P.Q.R." 45cat.com. Retrieved 16 August 2016. ^ "'SPQR' adds final touch to special derby kit". www.asroma.com. ^ "This Heat – S.P.Q.R." Beneš, C.E. (2009). "Whose SPQR? Sovereignty and semiotics in medieval Rome". Speculum. 84: 874–904. doi:10.1017/s0038713400208130. Look up SPQR in Wiktionary, the free dictionary. Wikimedia Commons has media related to SPQR. SPQR street light lamp in Rome.